Bellevue Hill Residence is a hidden gem, cushioned very comfortably in the upper hills of the Eastern Suburbs. Tucked away, the home is one that is truly unexpected. Designed and built from scratch, this three-storey family residence combines simplicity with luxury, designed thoughtfully alongside a tennis court, pool and garden scape. Our client provided a simple brief, wanting a system that “just worked”, and was “reliable, simple, functional and stable”, while still having “all the bells and whistles”. Our challenge – the enormity of the technical scope and the system requirements across the entire project. As a standard, AVD also ensured all the electronic architecture and components were designed, and integrated into one hidden, temperature-controlled distribution room, as well as seamlessly integrating speakers, lighting and control panels into the architecture. In building this new home from scratch, all the required cabling and equipment was carefully planned, as well as control locations designed to work to its greatest effect. Awarded: Cedia Winner for Best Integrated Home Asia Pacific Level IV. The 2,500 sq. Metre residence, including; six bedrooms/eight bathrooms/two studies/two wine cellars/home cinema/gym/swimming pool/tennis court/two garages (one with a turn-table)/as well as a two-bedroom guest apartment, were all to be seamlessly integrated using an easy to control system. To tackle the scope, AVD utilized a Savant Control System, which was fully customized with floor plan control. The high level of integration across all floors included security, HVAC (heating, ventilation and air conditioning), CCTV, access control, audio visual, remote access, lighting, and automated features such as blinds. We specially integrated a 180 inch anamorphic projection cinema, with full Savant system control and automated window treatments for full effect. 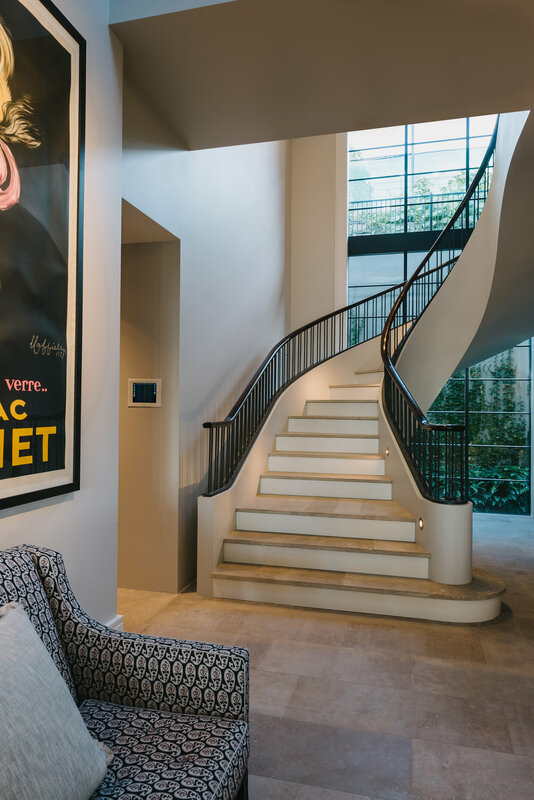 The Savant control system was utilised throughout the whole property, with both customised fixed and mobile iPads, which were able to control every aspect of the home. As an addition, we were able to include voice control, which was integrated to the Savant system using the Apple Home-pod. We integrated this functionality to set specific scenes, controlling Audio Visual/lighting and blinds. Our client's verdict: Our experience with AVD and their team from design phase, to installation, to execution/integration and after service has been incredible. We completed our home 18 months ago and I can’t speak more highly of the platform AVD created for us. We have a very large home with many elements and our interface is simply fantastic. The systems capabilities are brilliant but more importantly they are user friendly. We have built before and we attempted to do a similar system however regrettably unsuccessfully, due to the providers we used, using one to commence and one to complete and neither were a scratch on AVD. We did our research and Sandy and his team were diligent, professional and timely in the execution of our project. It shows how early involvement is key in the success of a project. AVD was with us from day one, and was able to advise on fundamental changes necessary to achieve the desired outcome for the entire project not just the AV and control systems. I touch wood as I say this, “our system is so robust and reliable, well designed and thought out that in 18 months honestly nothing has gone wrong”. Yes, we had a few teething issues as we fine-tuned how we wanted everything to work however the system and platform itself continue to perform reliably as we were promised they would. On the odd occasion where user error has caused a problem, the AVD team have been available promptly to assist and resolve. I truly can’t recommend AVD and their team more highly.